Mellencamp Newsletter: Sad Clowns & Hillbillies Out TODAY! John Mellencamp Community > MELLENCAMP.COM ANNOUNCEMENTS > Announcements & Updates > Mellencamp Newsletter: Sad Clowns & Hillbillies Out TODAY! It's always a great time to be a Mellencamp fan but even more exciting now with a super busy time for John! Check out the highlights below, but be sure to visit Mellencamp.com for all of the details! John's 23rd album Sad Clowns & Hillbillies comes out today! John is joined by his "singing buddy" Carlene Carter as his featured guest on the album. The first singles "Easy Target" and "Grandview" have received rave receptions and glowing album reviews are showing up daily! • Buy SC&H today online! • Watch John's interview on Late Night with Seth Meyers along with his performance of "Grandview (featuring Martina McBride)" and "Jack & Diane (acoustic)"
TODAY: SAD CLOWNS & HILLBILLIES ALBUM PREMIERE ON SIRIUSXM OUTLAW COUNTRY CHANNEL 60! John celebrates the release of his new album Sad Clowns & Hillbillies featuring Carlene Carter with a live in-studio visit with Mojo Nixon today at 5 PM ET on SiriusXM Outlaw Country, Channel 60 and streaming OnDemand on the SiriusXM App & Internet Radio. If you don't have an account, you can listen to the interview HERE when you sign up for a free trial. Catch John on Friday, April 28th, at 6 PM ET on SiriusXM's Volume (Channel 106). He will be on Debatable where the news of the day is discussed, disputed, dissected and even destroyed by hosts Mark Goodman and Alan Light every afternoon. John will be interviewed on NPR's World Cafe this Monday, May 1st at 2 PM ET. World Cafe can be heard on over 200 stations nationwide. Listeners can tune into their local affiliate station at the scheduled World Cafe broadcast time, check local listings. To listen live online, check out the WXPN Philadelphia stream at 2 PM ET at XPN.org by choosing WXPN from the ‘Listen Live’ drop-down at the top of the page. John will be performing on NBC's The Today Show on Wednesday morning May 3rd! Stay tuned for additional details next week. Page 18 of the May 4th issue of Rolling Stone Magazine includes a full page question and answer session between writer Brian Hiatt and John. The article speaks of how John invented modern country music and why he'll never stop smoking, among other intriguing questions. Look for the magazine on store shelves now! Ticket sales begin May 1st at 7 AM ET for Davenport, IA's Mississippi Valley Fair LEARN MORE. REMEMBER TO GRAB YOUR VIP TICKET BEFORE IT'S TOO LATE! We are offering Front Row VIP Ticket Packages and Diamond VIP Packages for most shows on the Summer 2017 Sad Clowns & Hillbillies Tour. Limit of six (6) per order. 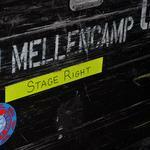 To find out if your show has VIP packages offered, click the blue info icon on the Mellencamp.com TOUR page. There are only a handful of front row tickets left for the whole tour and very limited quantities of Diamond VIP packages left, so act quickly! Re: Mellencamp Newsletter: Sad Clowns & Hillbillies Out TODAY! I bought the CD today at Red Cat Records in Vancouver, Canada. Love it! It sounds great! again an excellent album, John´s creativity cannot be stopped. when listeining to the opening track "Mobile Blue", I felt like back in 1987 when "The Lonesome Jubilee" came out. The band sounds fantastic, Carlene Carter´s contribution is worthy. I don´t care when a song has been written or recorded. there has been speculation on when "Grandview" was recorded. I think it´s good if a song like this now is published. maybe we can get some more details about this record and its songs here. and I hope i can get a vinyl copy soon. Thanks a lot for this music to all involved! Something old: “Grandview,” the current single from the album that arrives in stores today, is a sonic time traveler Mellencamp co-wrote with his cousin, Bobby Clark, in the 1990s. An early stab at recording the song featured Indiana native and former Guns N' Roses guitarist Izzy Stradlin and drummer Stan Lynch, formerly of Tom Petty and the Heartbreakers. Mellencamp said the "Sad Clowns" version of "Grandview" includes some vocals he recorded in the '90s and some recorded this century. Stradlin's gritty, insistent riffs and Lynch's beats were salvaged for the final version, and country vocalist Martina McBride came on board to portray Mellencamp's foil in the song's home stretch. "It took a long time to build this song," Mellencamp said. Interesting, thanks for this info! "All Night Talk Radio" also sounds like 90s, I am not sure. "Mobile Blue" being a cover of an old country-song from 1971, this album seems to be a collection of various interesting projects. currently i only listen to the downloads, until the vinyl version is available here in europe. no lyrics, no info on nothing. my favourite songs after the first listening rounds: Mobile Blue, Battle of Angels, What Kind of Man Am I. Great album. I listened after work on Friday on Spotify then grabbed the CD here at HMV in Glasgow, Scotland on Saturday afternoon. Glad to say, I've played absolutely nothing else since. This album is Quality music with some great instrumentals. Grandview is excellent, but other songs grow on me as well. All Night Talk Radio is classic, both instrumentally and lyrically. And Carlene Carter's voice is the perfect harmony. Great job. Thanks for working hard everyday, Mr. Mellencamp. Very much appreciated. Mine's on the way from the JM shop. Cant wait. Love Miriam and Carlene. You go girls !!! Had to drive all the way to Roanoke VA last year. Come to Knoxville TN soon John ! !